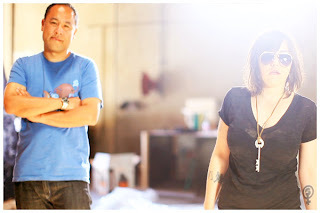 Video: Pillowfight - "Get Down"
Few weeks ago we started posting some music from Pillowfight, the duo of Emily Wells and Dan the Automator, who released their debut self-titled EP not long ago. Now they are back with a video for the song "Get Down." It's a fun poppy tune with a solid groove line , so the video of the two having some good times on the road is fitting. Although it is mostly Emily, that's okay. Watch below.